Wood at its finest, thanks to you! Our biggest dream: Build the present. Construct the future. We need you to achieve our dream! 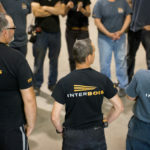 Discover the benefits of a career at Interbois!